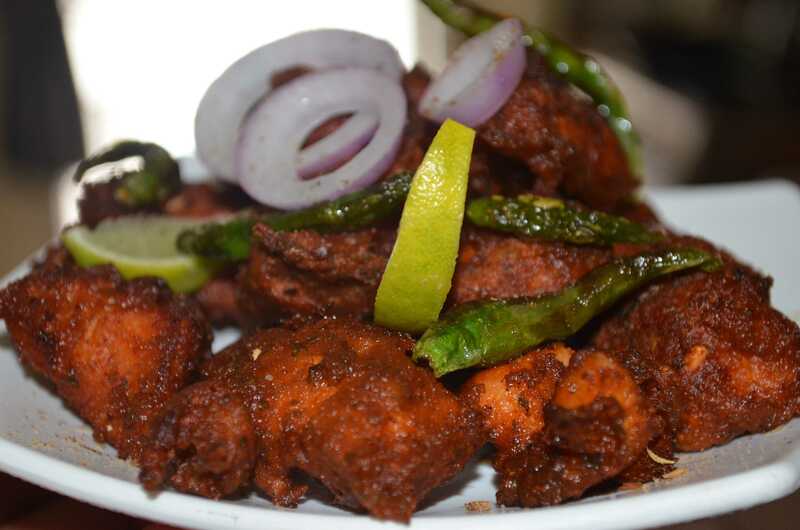 Chicken bezule…fried chunks of pre marinated chicken is a very popular street food of Mangalore, a city in southern India. Chicken bezule can be enjoyed as a snack along with tea or as a starter to a meal. Take all the ingredients from list B and grind it to a coarse paste. In a large mixing bowl take the ground paste, add cumin powder, garam masala powder, yogurt, lemon juice, salt and red food colour (if using). Mix well. Add the chicken and mix well. Cover the bowl, refrigerate it and leave it to marinate for atleast 3-4 hours or preferably over night. Before frying mix the rice flour and refined flour and deep fry in hot oil in small batches on medium high heat. Fry some whole green chillies along with the last batch of chicken. When done sprinkle little chat masala or lemon juice and serve hot garnished with fried green chillies.